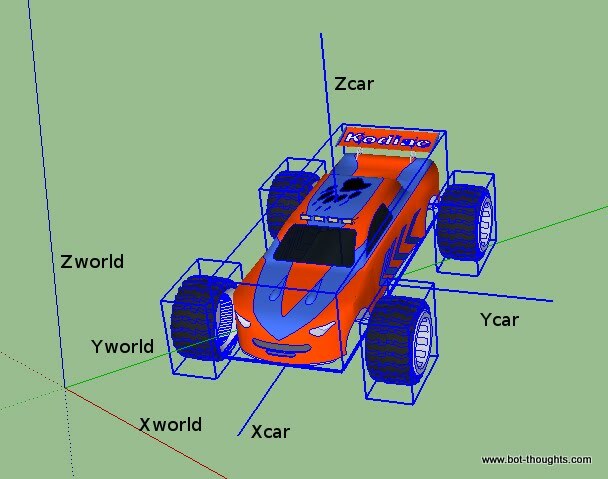 In working on my 2012 AVC entry, Data Bus, I've been evaluating the use of a 3D IMU (Inertial Measurement Unit) and AHRS (attitude heading reference system) to provide an accurate heading estimate. An IMU is comprised of some combination of gyros, accelerometers, and magnetometers and can provide enough sensor data to estimate attitude and heading in 2D or 3D. These sensors plus onboard processing to determine attitude and heading, is called an Attitude and Heading Reference System (AHRS). The AHRS fuses sensor data to determine which way is North and which way is "Down" and then it computes heading and vehicle attitude. At long last I've successfully programmed my ARM7. I developed my own breakout board and switched to an LPC2103, an upgraded version of the LPC2101 I started the road test with. I'd planned a Data Bus Demo today but foolishly cancelled, listening to the weather reports of rain and cold. Of course, this is Colorado, and weather reports always lie. It's a beautiful day today. That figures. I'll try again in late April or early May. I'm getting close on pose estimation. That's the last piece of the navigation puzzle, then it's on to obstacle detection and avoidance. Meanwhile I headed down to Club Workshop for the Automate Denver! event which was moved to Saturday. 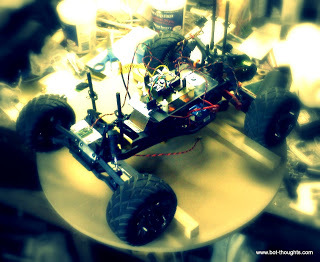 Less than 3 months left before the Sparkfun AVC as I write this. I'd love to build out a full-blown, pretty-looking ground control system that controls every aspect of Data Bus but there's simply no time. On the flip side, spending all my time fighting bubblegum, duct tape, and bailing wire solutions wastes time and burns me out. 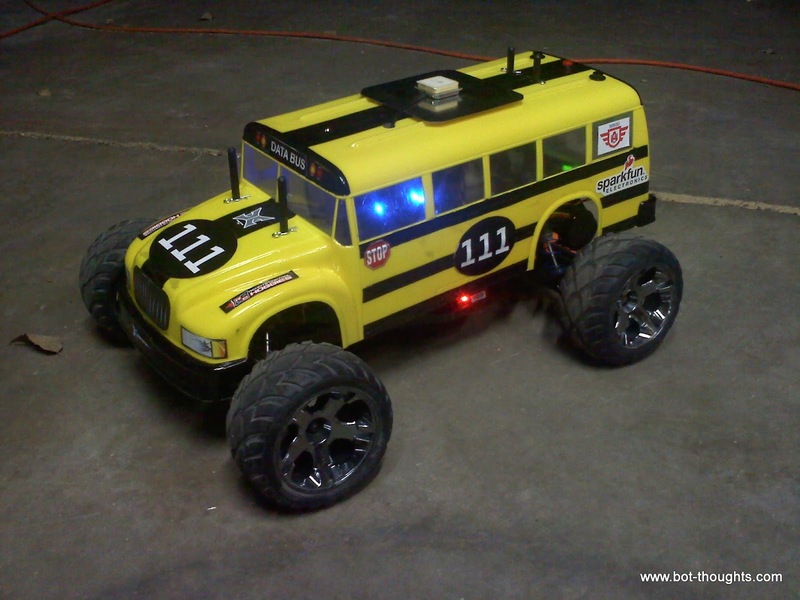 As you no doubt recall, in celebration of the week I'm hosting a Data Bus Demo this Saturday for friends and family and a few local AVC participants. Here's the updated 2012 version of the gyro calibration I performed on Data Bus in 2011. The goal as before is improved heading accuracy. Target: L3G4200D on a Pololu minIMU-9. 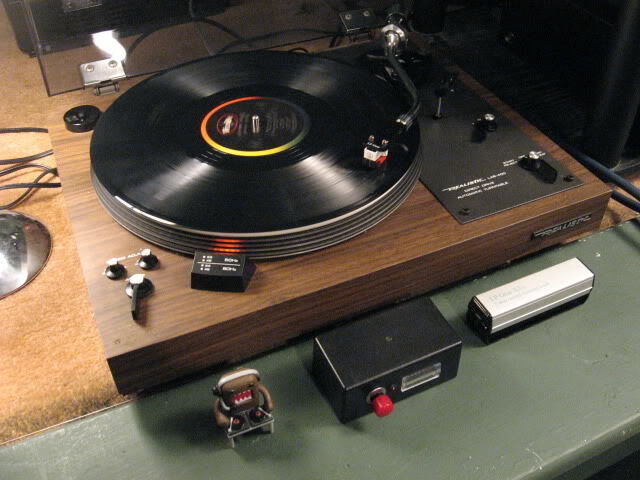 Last time I used my "high precision rate gyro calibrator," a 1970's Realistic Lab-400 Direct Drive turntable. I used it again this time. I also used by gyro/magnetometer calibration machine. After all these many months Data Bus finally logged some real world data! What excitement! Two weeks away from the big demo! Eek! Why'd I wait so long to run the robot in the real world? I wanted to take my time understanding the problem better than I did last time so I would be, hopefully, less surprised by the results and closer to a working solution. Here are the results of three separate runs, driving the robot around slowly outside the house AND two runs at Sparkfun!